Happy Monday everyone! After a few months' hiatus of regularly painting my nails, I've gotten back into the routine of weekly manicures and thought it would be fun to share with you what's been 'decking my digits each week. To kick off my first "Manicure Monday" I have for you a very holiday-appropriate color, CND Indian Rhubarb. 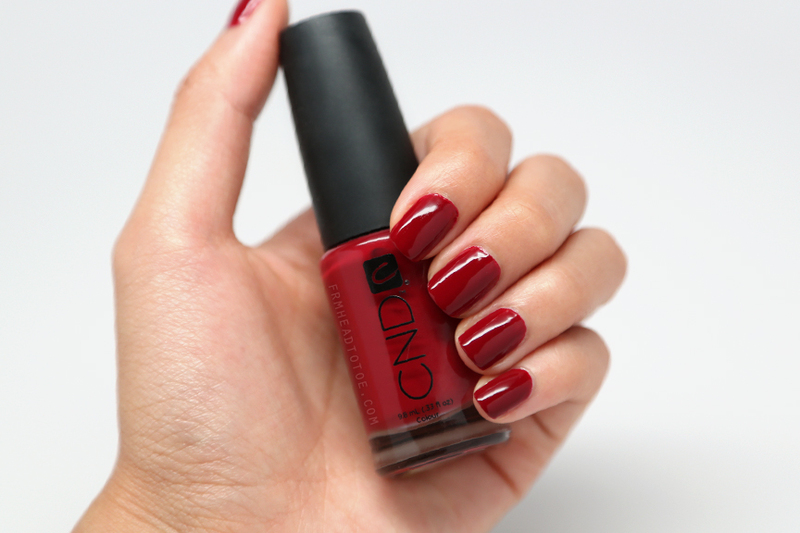 Indian Rhubarb is a gorgeous deep red creme finish polish that is opaque in two coats. The color is slightly darker than in these photos and leans warm and slightly muted. Call me crazy, but I think the color actually deepened after wearing it a few days as well. The CND brush is the handy flat type which is so great for avoiding the gloopy polish effect from having too much nailpolish on the brush. I used CND Stickey Base, 3 coats of CND Indian Rhubarb (2 would've been totally fine), and Seche Vite top coat. For some reason, my Seche didn't give the super glassy top coat effect I usually get with other polish brands so I'll probably try a different top coat next time. Let me know if this has happened to any of you with CND polishes before! In any case, I've been loving this color. It's very Fall, very classy, very "oxblood", "burgundy", "red wine", etc. Nothing Earth-shattering, but a wonderful staple that is very flattering and has a brightening effect on my hands. Have you tried this shade? Do you like CND polishes? Let me know in the comments! Super gorgeous! I love the deepness of the red! My current fave "fall red" this month was China Glazes' Long Kiss. It's a metallic ruby kind of red with micro gold shimmers. Super smooth effect! Love it! Can't wait for more Manicure Mondays! So, to get to the point, I, too, have been fighting a long battle with acne. And it's just so frustrating. I have seriously tried everyyything - Proactiv & all that "good" stuff, lol. I basically have the same skin type as you; oily, combination, acne prone, as you've mentioned in your videos. I thought about checking out the Clearasil PerfectaWash, but then I was wondering what else I should apply after that? The one good thing about Proactiv was that I never, ever had to deal with black heads. But now they've been popping up. I was wondering if it was because of the wash or the toner or something? I've never used Proactiv myself so I can't really give you fair advice about it, but I will say that Perfectawash was good for me on the acne side, short-term. It started to dry out my skin after using it for months so I'd probably only use it if my skin were in a bad breakout period. For blackheads, you might want to make sure your moisturizer and makeup aren't oil-based and clogging them! It's a gorgeous color, but I've banned myself from buying red nail polish. 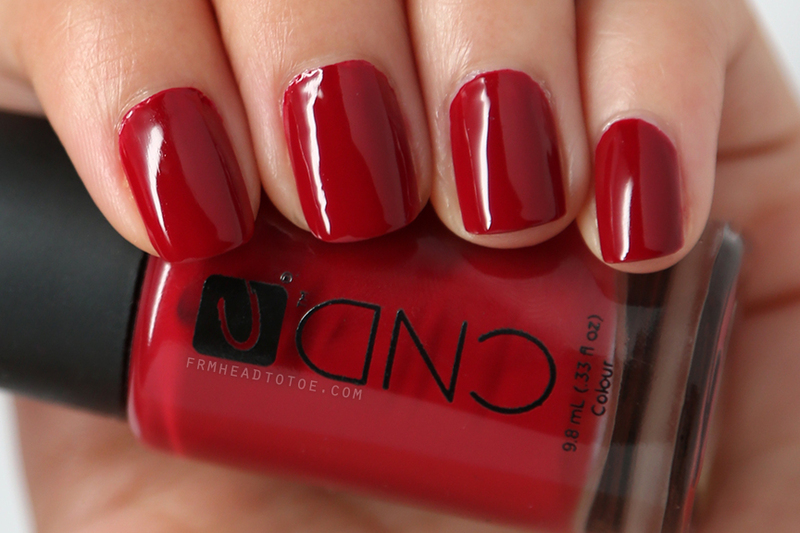 Love this darker red color! That is an epic red nail polish. Love it! I thought you need to use a UV light thingo-ma-bob! I love CND, such great colors. This is a perfect red for Fall; does it stain your nails though? It's still on my nails but I'll see once it's removed! What a beautiful fall color ! You probably already know this, but I will forever be in love with Rimmel simply because they have flat brushes which makes it incredibly and wonderfully easy for polish application. I'll definitely have to check this brand out, especially that gorgeous color you're rocking! Love this color polish. The color looks quite rich and glossy from the photos! Reminds me of red carpet manicure gel polishes! Do you have any recommendations on how to prevent chipped nails? I admittedly put my hands through a lot throughout the day (I work as a barista so my hands are always wet and I bang them around a lot when I'm trying to grab milk jugs out of the fridge) and I always want to paint my nails but the ugly chips in my left thumb and forefinger always stops me from doing so. love this red! so classic and very holiday appropriate!